Range Rover and LR4 crept down cliff road. Not a bad idea, since we were just getting started on our unbelievable “Land Rover Colorado Experience 2010” drive, having left our palatial Lumiere Hotel rooms behind, driven into downtown Telluride, which is located at the bottom of a Rocky Mountain canyon, and then our caravan of Land Rover LR4s and Range Rovers turning 90 degrees left off the main street of town, to start driving up from 9,000 feet on something that was described as a county road, but was more a jagged rock-pile formed into a small ledge indenting the side of the San Juan Mountains. 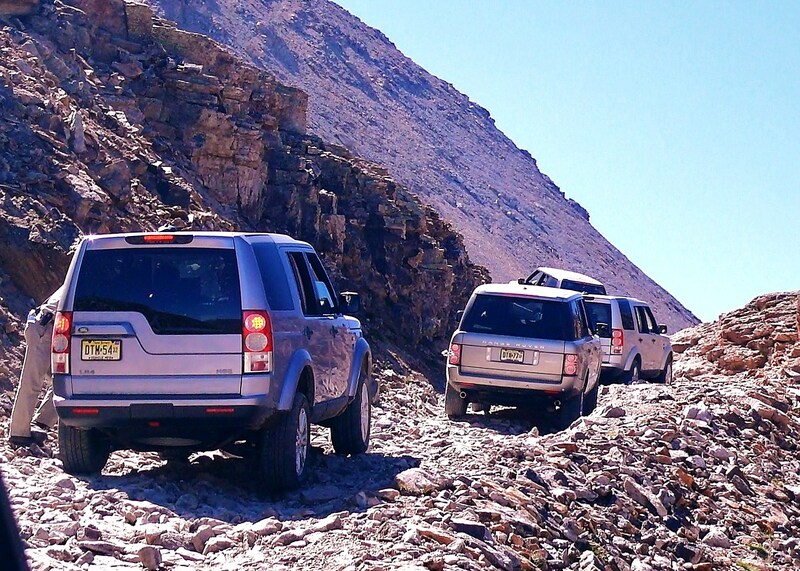 We were divided up, two journalists with — thankfully — an expert off-road driving guide from Land Rover in each vehicle. When they spoke, we acted. So when our guy said stop, I stopped. The jogger — somebody local or else a crazed, high-altitude-overload training fanatic — came slowly along, with a dog on a leash. Stopping allowed the jogger to pass without facing a moving vehicle. It still was testy, because if you looked out our right side windows, you saw we were about 2 feet from a cliff with several hundred feet of sheer drop, and if you looked to the left you saw we had about 2 more feet to a rock wall that reached to the sky. Our project was a two-day trek. We started in Telluride, which is a town that blossomed from 700 to 4,000 residents when the Rio Grande Southern railroad opened a run from Ridgway in 1870 to service the miners, and then dissolved to near ghost-town status in the 1950s, reviving only as a new and trendy ski-resort town in 1972. The cliffside roads up from Telluride were built to allow gold and silver miners to get to the mines that were dug at random in the mid-1800s. Those roads haven’t been maintained as actual roads since. Aside from the occasional off-road Jeeps and purpose-built specialty trucks and buggies, our caravan of shiny new Range Rovers and LR4s stood out, and as the vehicles soon became less-shiny, they also became much more appreciated by us, because our lives depended on them. There were 13 automotive journalists attending the far-out unveiling of the 2011 LR4 and Range Rovers, and all of us knew that when Land Rover holds an introduction, it’s an adventure — whether taking on Utah’s Moab Desert, negotiating a special Land Rover course in Quebec’s Laurentian Mountains, or revisiting the Continental Divide country of highest-altitude Colorado. These 2011 models are the best vehicles the British company has ever built, although in their 40-year history, they always have been over-engineered for normal use. My experience with them goes back to the 1990s, when they first came to the U.S., but before they became cult-figure vehicles for Hollywood movie celebrities. As soon as I examined and experienced the steel-girder-like frame rails and the lengthy suspension travel, as well as the armor-plating on the underside, I declared that Range Rovers would be the vehicle of choice if you were driving to Hudson Bay — without usingÂ roads. 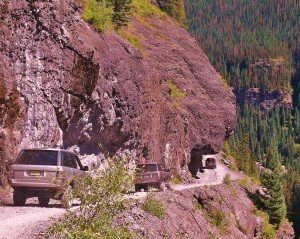 An LR4 -- note the angular rear window -- followed Range Rovers up toward the Continental Divide. Something like 95 percent of SUV buyers don’t ever take their vehicles off-road, but most of those who buy Range Rovers and Land Rovers do, and they are encouraged to take them to the most rugged and challenging sites around the world. Another side to the company’s healthy perspective on off-roading is its “tread lightly” focus on maintaining and keeping off-road areas unspoiled. Even a region as rugged and stunningly beautiful in its desolation as the San Juan Mountain range. Switchback gave unique view of LR4, sunroof. 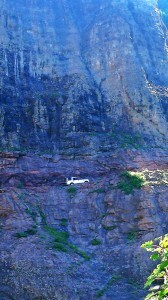 Our route took us up the numerous switchbacks to scale one side of the canyon’s wall. We passed numerous abandoned mines to reach Imogene Pass, which is at 13,000 feet, and continued on the rugged road that was originally created to get through Ute Indian country. We came down into the town of Ouray, and checked into the Beaumont Hotel. We went from the ultramodern, year-and-a-half-old Lumiere Hotel in Telluride, to the Beaumont Hotel in Ouray that had long been abandoned until it was bought and totally restored in 2001. “It’s like a snapshot of the 1800s,” Burns said. Ouray is a tiny town that was named after the chief of the Tabeguache Utes, who had once rebelled against Indian Agent Nathan Meeker’s attempts to herd them onto a reservation in 1880, as part of swindling them out of their land for the sake of those randomly probed gold and silver mines. All along our trek, the dozens of abandoned mines could easily be spotted by the residue of discolored rocks and gravel hanging like dried teardrops from those holes in the mountain range. Cliffside trail was less than just narrow. Consider that we drove, except for lunch stops, from 9 a.m. until 7 p.m.for two days, and while we were exhausted from the absolute focus required to pick our way over the smallest choice of boulders, we only covered a total of 80 miles, with no more than 15 of them on real roads. Our vehicles were fortresses designed for such duty. The LR4 has a base price of $48,500, and in many ways is the more versatile family hauler, because it has three rows of seats to house seven occupants. An enormous sunroof covers virtually the whole top — open-air above the front seats and sunroof above the rear. The Range Rover steadfastly remains a two-row vehicle, uncompromising in its combination of interior luxury, with rich wood and leathers, and audio systems, and rugged, go-anywhere capability. 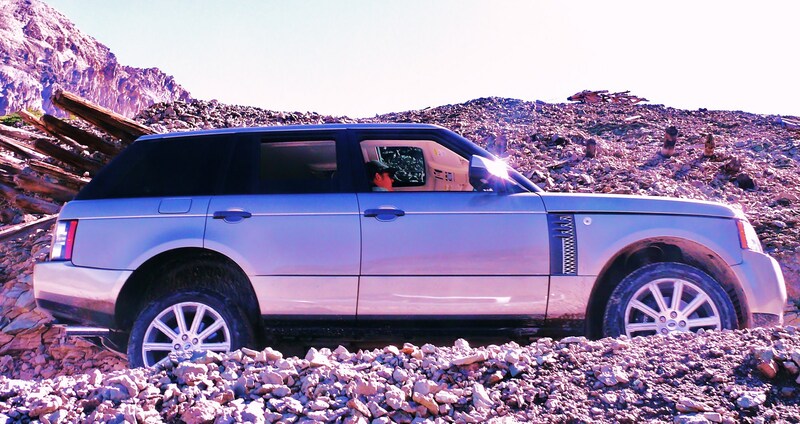 Range Rovers are sometimes bought as status symbols by celebrities, but the company men prefer that those who buy them take them interspers serious off-roading along with the smooth highway cruising. 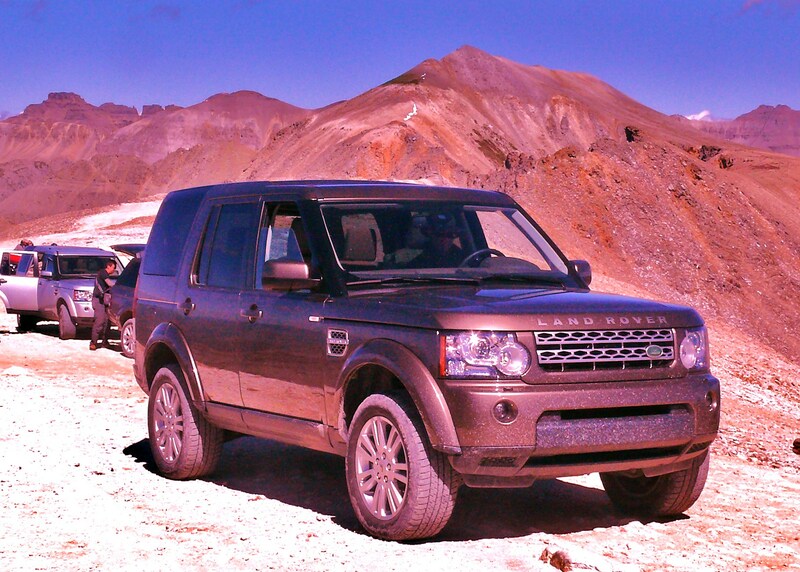 An LR4 was only a speck on mountainside. Range Rovers start at $60,495 for the Sport model, $79,685 for the HSE. Both the LR4 and the Range Rover use the 5.0-liter Jaguar V8, a direct-injected, dual-overhead-camshaft gem with variable valve-timing, turning out identical numbers of 375 horsepower at 6,500 RPMs, and 375 foot-pounds of torque at 3,500 RPMs. That power was more than enough, even for the extremes we confronted and conquered, but if you get the Range Rover, you can choose the supercharged version to boost power from 375 to 510 horses, and from 375 to 461 foot-pounds of torque, a peak that is spread out from 2,500-5,550 RPM, although that adds another $15,000 to those base prices. The LR4 is still the solid, body-on-frame construction with hydroformed, high-grade steel frame components and double-zinc-coated steel body panels, while the new Range Rover has been refined with a one-piece monococque body attached to three steel subframes, for the best of both worlds. The fenders, hood and doors of the Range Rover are aluminum for light weight, and the rest is double-zinc-coated steel. 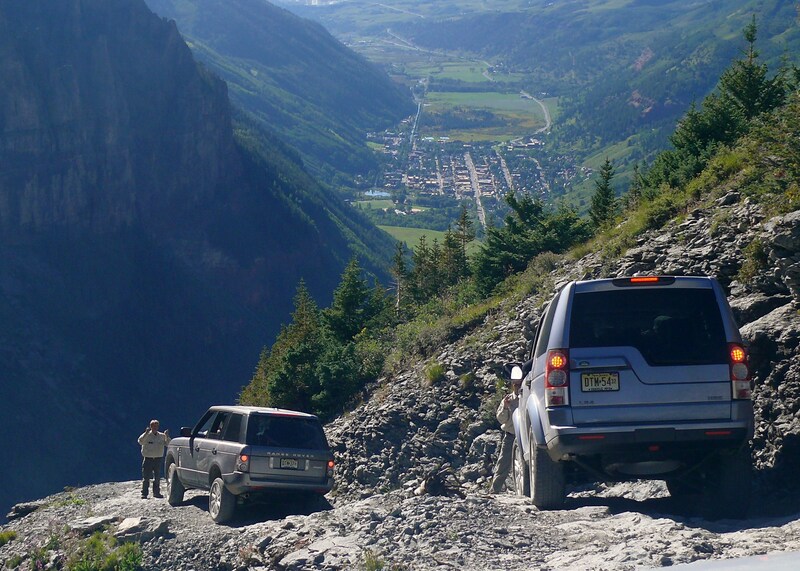 We had driven an LR4 the first day, so we switched to a Range Rover the next morning, when again we had bright, sunny weather as we drove from Ouray to Silverton, our lunch destination. Later we climbed back up to the top of the world, preparing for a spectacular descent, on Black Bear Pass Road, where we crept down a series of switchbacks that even now, in memory, seem impossible to have attempted. With all that available power, it seems an incredible irony that the best part of both vehicles is their ability to inch down severe, treacherous cliffs. In either the LR4 or the Range Rover, the console-mounted controls become vital. The ZF 6-speed automatic has command shift that sets to normal, sport or manual, and the permanent 4-wheel drive has 4-wheel electronic traction control, while the 2-speed-transfer allows shifting on the move with an infinite variable lock on the center differential. Terrain Response is operated by a knob on the console, which can modify the engine, transmission, both differentials, the DSC, as well as the traction control, by which click of the knob you select.One setting is for general roadways, with alternatives for grass-gravel-snow, mud and ruts, sand, and finally to rock crawl. With all of that, you might shift the gear lever into “1,” locking the differential into low range 4×4. Terrain Response modifies the responsiveness of your engine, transmission, both front and rear differentials, the DSC (dynamic stability control) governing active roll mitigation, cornering brake control, and hill descent control. Thank God for hill descent control. 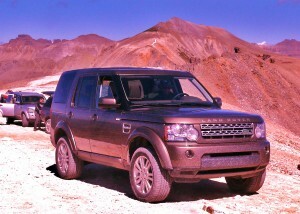 Land Rover LR4 at rest on top of the world. 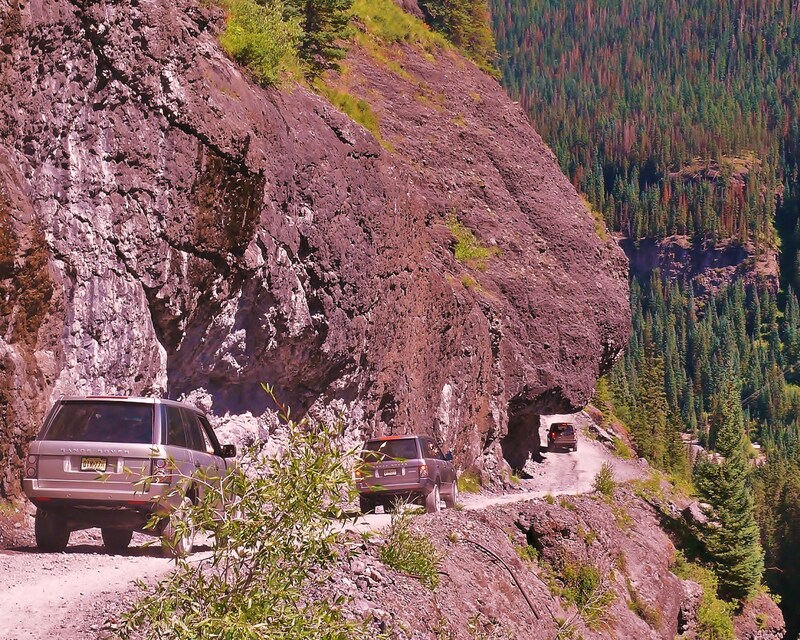 Amazingly, once engaged, you can take your foot off the gas and leave it poised but not riding the brake, and the system causes the big truck to tiptoe down the steepest grade, or pile of rocks and boulders, at something like 1 mile per hour. When we got to the top of Black Bear Pass Road and started our descent, I turned the main knob of Terrain Response to “rock crawl,” made sure we were in low-range lock, and shifted into first gear, as instructed. My co-driver, however, fell victim to a high-altitude headache on the second day, and said he didn’t feel up to the concentration and would forfeit his turn at driving. 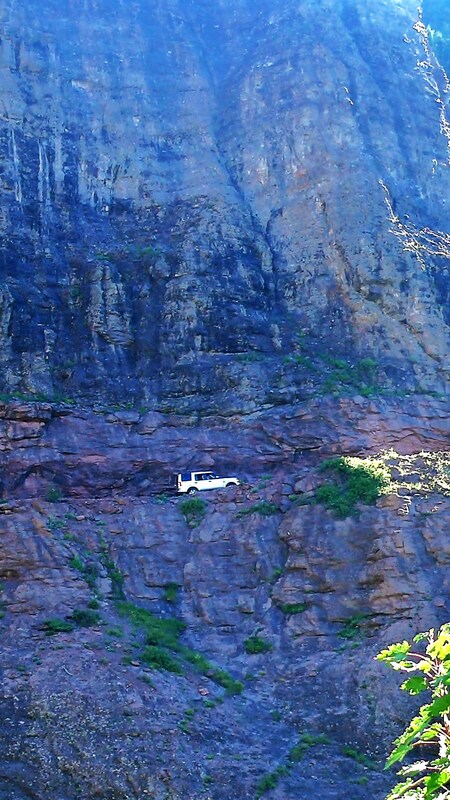 That allowed me the combination thrill and relief of driving all the way down that cliff, back to Telluride. As a veteran of successfully scaling the icy avenues of Duluth, MN., in the winter, I was greatly relieved to drive that whole stretch, enjoying the adrenaline high. Extremely focused driving is the easy winner, compared to sitting helplessly in the back. The cliff where we started our descent is a stark, granite facade, rising 2,400 feet above Telluride, and that thin column of water splashing down the wall nearby is Bridal Veil Falls, the highest waterfall in Colorado. Some of the switchbacks on the rugged and primitive trail are shaped more like a “Z” than an “S,” which means that even with quick steering and an excellent turning radius, there was simply no way to make the turns in one swing. Our guide got out, stood at the precipice, and waved me forward. “More…more…more…” he said. I inched forward until he finally said “stop.”Â I stopped, and needed no reminder to hold my foot firmly on the brake pedal, then engage the emergency brake, then with my foot still on the brake, shift to reverse. That way, there was no creeping forward, which might have led to something more than “creeping” downward. When we finally got to the bottom, the caravan stopped to change the right front tire of one of the other Range Rovers. My co-driver seemed miraculously recovered and asked to drive the rest of the way. That was through the town of Telluride and the luxuriously smooth ride on theÂ short stretch of highway we enjoyed back to our Lumiere Hotel. Instantly, it seemed incomprehensible to consider what we had just done. that we had just driven . Never had we driven so long, with riveted focus on every inch of moving up, over, and down, for two full days, yet covering so few total miles. Land Rover vice president of communications Stuart Schorr said: “Our customers can spend a day on these trails and see sights most people will never see.” We had done exactly that, witnessing sights and sensations that only precious few other humans — beyond the Utes and the miners — will ever see. The home stretch was the delicate descent by Range Rover, left, and LR4 back to Telluride, far below. It’s such as you learn my thoughts! You appear to understand so much approximately this, such as you wrote the book in it or something. Thank you for one more informative internet site. The location else could I get that type of information written in such an ideal manner? I’ve a mission that I’m simply now working on, and I’ve been on the appear out for such details. Quite instructive and good bodily structure of topic matter, now that’s user pleasant (:. I like this website very much, Its a real nice post to read and incur information. I really like that shot. I like shots that tell a story with them. Great set up. I’ve been surfing online more than three hours as of late, yet I never found any interesting article like yours. It’s beautiful value sufficient for me. Personally, if all web owners and bloggers made just right content material as you probably did, the web shall be a lot more helpful than ever before. I every time spend my half an hour to read this blog’s articles or reviews all the time along with a cup of coffee. I love what you guys are usually up too. This sort of clever work and reporting! Keep up the excellent works guys I’ve incorporated you guys to my own blogroll. (Goose down is the best, but I’ve always wondered what makes Canada Goose down special, eh? — JG).